Learn about the many benefits of trusting Flue Steam with your kitchen exhaust duct cleaning. 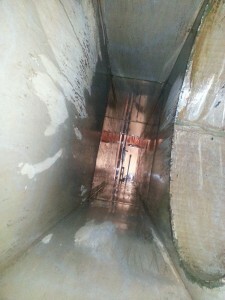 Every commercial kitchen needs periodic exhaust duct cleaning service. You may have many options for contractors to provide this service, but here at Flue Steam we believe we can provide superior service. Here are the top 5 benefits of working with us to keep your exhaust ducts clean using a combination of hand scraping and steam cleaning techniques. First and foremost, the most important benefit of kitchen exhaust duct cleaning is it enables your business to stay open. Without routine cleanings, your kitchen would quickly become in violation of local fire and safety codes. Getting your kitchen exhaust duct cleaning from Flue Steam is a particularly smart choice because we provide convenient proof-of-service stickers that make record-keeping easy. The reason commercial kitchens are required to get exhaust duct cleaning is that it helps reduce the risk of a fire in the ventilation system. Without cleaning, grease vapor produced during cooking would build up inside the exhaust hood and ductwork. This greasy buildup could then ignite if heated to a high temperature and easily spread through the ductwork to every corner of the building. By simply removing this grease, you eliminate a potential fire’s fuel source and help keep it from spreading. At Flue Steam, we can provide extremely thorough grease removal using steam cleaning equipment. Dirty exhaust systems can actually begin to interfere with proper airflow over time. This results in issues with smoke, odors, and heat in the kitchen as the system is no longer able to facilitate adequate ventilation. Eventually this dirty air may begin to make its way to other parts of the building where it may affect the comfort of diners as well as your cooking staff. Fortunately, by getting an exhaust system cleaning from Flue Steam you can promote good ventilation and clean air. Our technicians can clean and service your swamp cooler as well as your exhaust system to ensure a good balance between incoming and outgoing air. One particular advantage of working with Flue Steam is that our services are available at the times that suit your business needs. We offer emergency service 24/7, and we can also offer early morning or late night cleaning so that you can get service without having to alter your kitchen’s hours of operation. If all the above benefits haven’t convinced you to get service from Flue Steam, remember that we offer grease filter exchange service too. This service is the most convenient way to ensure your grease filters stay in good condition. High-quality grease filters can help make your exhaust duct cleanings last longer by capturing more grease before it can enter the ductwork, so kitchen exhaust cleaning with grease filter exchange from Flue Steam can really deliver a great value.